Call Today for Jukebox Machines! Colonial Vending Amusements is the go-to party rental company in the Greensboro, NC and Winston Salem, NC area. We provide a full stock of amusement games and equipment to people and businesses all over the area. We have a full selection of pool tables, jukeboxes, arcade games and amusement games available for rent. Call us today to learn more about our selection and availability. Why go to an expensive venue when you can bring the party right to your backyard? We offer arcade game rentals and party equipment such as jukeboxes, pool tables and more so that you can throw your children the best birthday party ever. Their guests will be amazed by all there is to do and you won’t have to pay an arm and a leg at an expensive venue! Call us today to book your rental equipment for your child’s birthday. Colonial Vending Amusements is perfect for your special events and fundraisers. We rent out all our party equipment to both businesses and individuals in the Winston Salem, NC, Greensboro, NC area. Whether you are hosting a fundraising event or a community event, we can provide all the entertainment you want to keep your guests busy. For more information about our rentals, give us a call! Why spend time in a muggy, crowded arcade, when we can bring the arcade games right to your front door? We have a full selection of classic and contemporary arcade games that people of all ages will enjoy. From video games to simulators and more, we have all the arcade games you could want, all brought to the comfort of your home or backyard. Give us a call to learn more about our arcade game rentals! If you’re looking for a unique way to liven up your party or event, ask us about our jukebox machines. We deliver juke boxes right to your door so that your guests can break a leg on the dance floor to their favorite tunes. We have an assortment of jukeboxes to choose from. Choose your ideal color and style and we will make sure that your party is complete! Call us today to learn more about our jukebox machines. Our pool table rentals are perfect for all kinds of occasions. Our pool tables are top-notch and we can put them anywhere in your home! Pool tables are a popular choice for adult parties, including bachelor parties and engagement parties. Our deluxe pool table rentals come with all the accessories and can really help to fill an empty space, while also keeping everyone entertained. Whether you are waiting to purchase your own pool table or you just want the entertainment for a few days, we are happy to help! 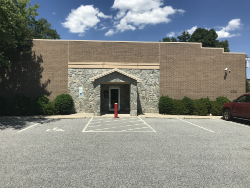 We have built our reputation in the Greensboro, NC area on providing excellent quality and outstanding service. We value our customers and the relationships we have built and look forward to carrying on the tradition for the next generation. We offer the best lines of pool tables and accessories including balls, cue sticks, play kits, custom wall racks and everything else our customers need to enjoy their custom-made pool tables. We will build your table with high quality materials and special techniques to ensure it meets your needs. Whether you want to rent a pool table for a day or even the whole weekend, then Colonial Vending Amusements can help. Setting up a pool table on your own can be a hassle. We can handle the set up and tear down process so you don’t have to worry about it. Our pool tables can also be set up indoors or outdoors depending on where your event is. 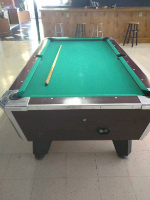 If you need to rent a billiards table in the Greensboro, NC, then make sure to count on us. Are you hosting a large event such as a festival or outdoor fundraising event? Here at Colonial Vending Amusements, we also rent out ATMs for your convenience. Rather than having your guests leave to go and get cash, we can make it accessible and easy for them so they can continue to have a great time! Don’t worry about the ATM operations; our team will handle everything. Call us today to learn more about our ATM rentals. 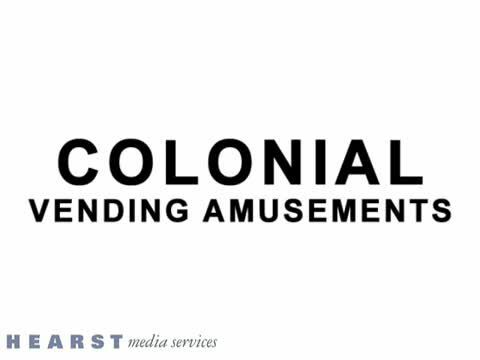 Here at Colonial Vending Amusements, we want to make sure that you and your guests are entertained at all times. Whether that means you want to rent out an arcade game for your child’s birthday or you want an amusement game for your fundraising event, we are here so that you can have a great time! 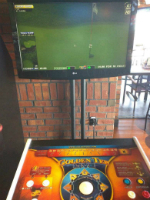 From our pool tables to our arcade games, we have entertainment for people of all ages! Make sure to call us to book your rental.